It’s that time of the year, when great acidic tomatoes are everywhere. If they aren’t growing in your back yard, pick up a basket at the Farmer’s Market and try this easy, delicious recipe. This is especially a good recipe for a dinner party because it’s easy, fool-proof and presents very well on a dinner plate. Cut the top 1/3 from each tomato. Using a spoon, scoop out half the tomato making a nice round well to hold your stuffing. 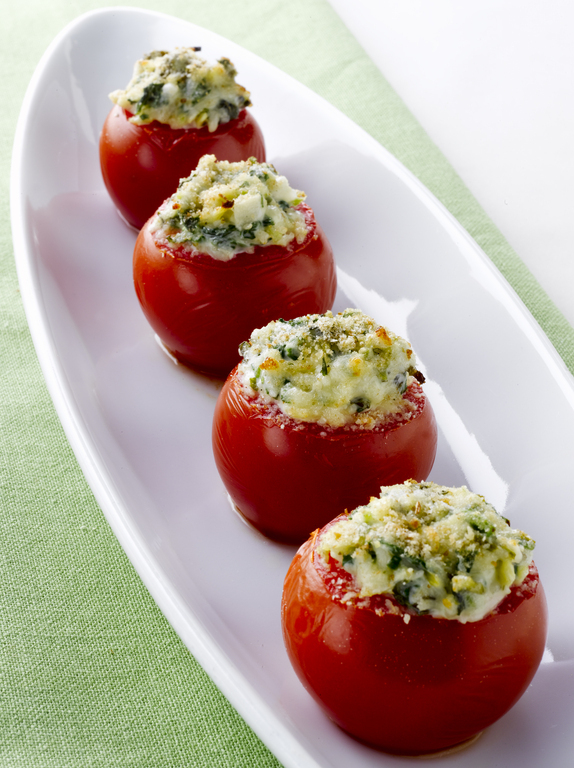 Sprinkle tomatoes with salt and arrange in a 13×9 glass baking dish coated with cooking spray. In a mixing bowl, combine the remaining ingredients and mix well to incorporate the oil into the breadcrumb mixture. Stuff the breadcrumb mixture into the tomatoes and bake at 350F for 30-45 minutes or until tomatoes are golden brown on top and soft. The skin will begin to separate from the tomatoes when they are done. This entry was posted in Vegetable Side and tagged baked stuffed tomatoes, baked tomatoes, parmesan spinach stuffed tomatoes, roasted tomatoes, stuffed tomatoes by quarlj01. Bookmark the permalink.